Is It Time To Replace the Intel Corp. CEO? Apparently, the PR stunts by Intel Corp. executive management, orchestrated and led by Brian Krzanich, did not impress investors in a positive way. 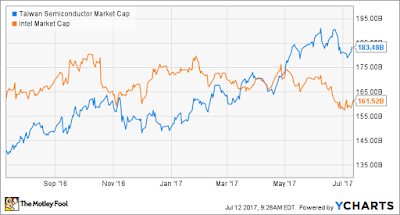 Beginning in May 2017, stock market capitalization of TSMC of Taiwan, surpassed that of Intel Corp, as the attached chart demonstrates. It is now clear more than ever that executive management was not able to deliver the promised goods, including mass shipment of 10nm silicon products and that there is no end in sight to the execution problems that the company faces. I have no doubt that the root of the company ailments have to do with executive incompetence, as well as the side effects of laying off a very large number of experienced employees during the 2015-2016 period. During this time executive managers continued to rip fat salaries and bonuses, however, the workforce became diluted of industry veterans who could have saved the day, with their wide knowledge and experience. The short-term gain that the company received through the massive layoffs paid back inversely, gutting the organization from the human capital that once kept the execution chains ticking 24/7/365. By replacing knowledgeable and experienced employees with much cheaper newbies, Intel Corp. executive management, sealed off all safety exits and set fire to the engine room. Highly speculative and very expensive external business acquisitions will not make up for the current Intel Corp. executive team's lack of ability to run a profitable business for the long run and therefore, successfully perform their duties to INTC stock holders. Is Intel Corp. board acting as a rubber stamp, led by the nose by BK's daily whims? Perhaps they should wake up and find a CEO who is more into creating a functioning organization, rather than setting the stage for endless and mindless dog and pony shows that hardly phase the investors low opinion of the company's future. Interestingly, Ashraf Eassa, who frequently writes commentary covering Intel Corp. is seeing the case for replacing BK, along lines similar to mine. Long ago and far away, I and others had Intel front-line manager (FLM) training. Courses: There were online and internal training courses that led to Mgr. paths. Most were good, some not. The best thing about the in-person courses was always meeting others as managers and discussing the situations that arose, and getting feedback and new perspectives on your own situations too. But then MTP vanished. 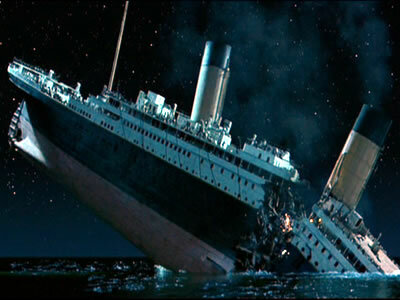 And apparently some of the other manager training did too or was curtailed. I was made aware of that by some recent anonymous posts by an Intel FLM (see references below). Seems like development paths for managers had taken a back seat. So it was with some interest that I learned of Google's Project Oxygen back in 2009. 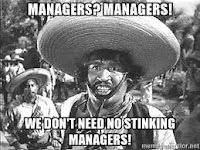 It started with the premise that, to paraphrase, "We don't need no stinkin' managers!" But the actual conclusion they came to was kind of the opposite. "We do need managers. And what if everyone had a Great Manager?" Project Oxygen came up with 8 Rules and an upward feedback survey and much more, but I don't know how much they really still use it. It would be interesting to hear that from inside Google. The re:Work teams' copies of the Google Guides are a good place to start to get more details, and as a course of self-study. If you want more, well I guess you can Google it! (-: It's now part of Silicon Valley lore. Bottom line: Managing is a different set of skills than you may have been trained for as a technical specialist. (Chemist, Engineer, Programmer, Machinist, etc.) Learn to recognize those who are great managers and maybe if they have helped you, and you can learn to help them too. And if you choose at some point a management path, well get some of those skills solidly under your belt. Heck, get them under your belt even if you DON'T follow a management career. They can help you no matter what. 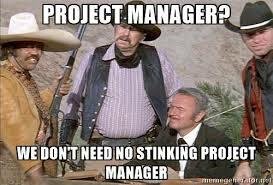 Learning to "Manage Up" is always a useful skill no matter what org you are in. "Rehabilitation" - https://www.thelayoff.com/t/NZoSFt7 - An anonymous FLM's view of his situation in June 2017.